Caption slip reads: "Photographer: Paegel. Date: 1958-01-03. Reporter: Donoghue. Assignment: Hemophiliacs. Special Instructions: Sunday or Monday. 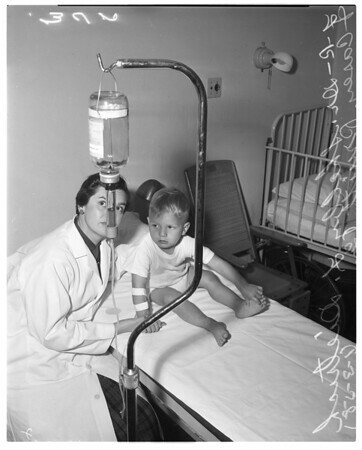 27-28-34: Casey Pruitt, 2, of 13817 Murdoc street, Norwalk, receiving 50 cc's of blood plasma at California Hospital from Doctor Shelby L. Dietrich, medical director California Babies and Children's Clinic".